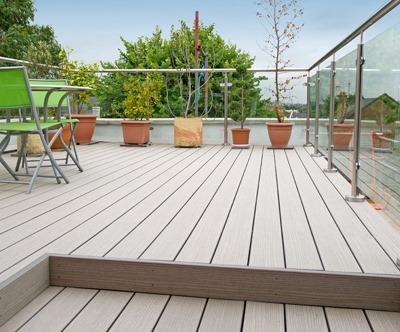 As you browse our website, you may find yourself wondering what our high-quality garden decking looks like in situ. On this page, you’ll find numerous examples of projects for which we provided the materials, including several decks that we installed ourselves! 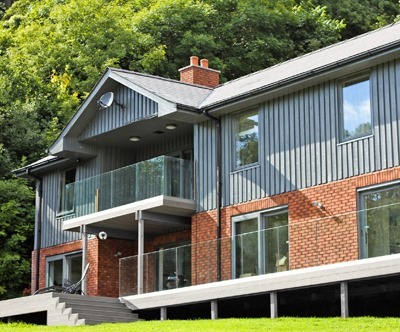 Select a case study to view photos and read all about that project, or give us a call on 029 2080 3756 to discuss your own project with a member of the TimberTech team. You can also order some FREE decking samples if you like what you see here. This couple wanted a complete garden makeover. They had an old wooden decking that desperately needed replacing and we were more than happy to help. Our low-maintenance EasyClean Legacy deck boards were the perfect addition to their new garden space. Products from our sister companies, PrimaPorcelain and SunSpaces. A customer in Cwmbran, South Wales got in touch to discuss some outdoor ideas with the TimberTech team. 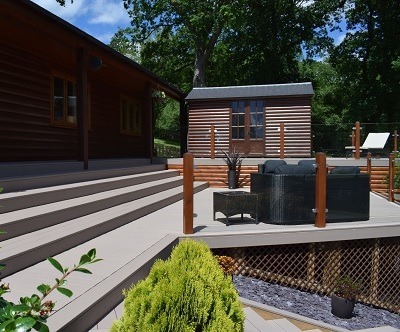 He wanted to add a stylish and functional seating area to the rear of his property, and this was achieved using our wonderfully contemporary EasyClean Terrain deck boards. After conducting lots of online research and watching some installation videos on YouTube, this couple from Surrey came to our Slough showroom and decided that TimberTech was the perfect material for their planned garden deck. 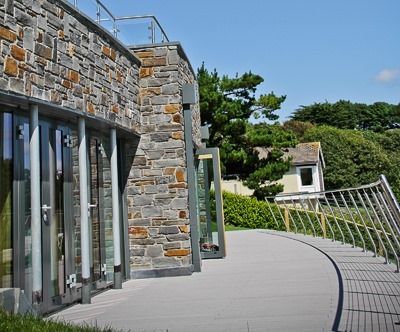 They also used our aluminium railing system for added safety and visual appeal. Our customers from Edenbridge were able to modernise the garden of their Victorian property with a little assistance from TimberTech's EasyClean Terrain+ Silver Maple composite decking. Our design team helped these customers to create an attractive multi-level garden that will last for decades with virtually no maintenance. Take a look at this case study to see what they thought of our boards - and to see some photos of their smashing new outdoor space! This couple’s wooden deck became completely rotten just five years after they moved into their home. They decided that our EasyClean Legacy decking would be the perfect replacement – the capped Tigerwood boards will last for decades! Read our case study for more information on this project, plus stunning photos of the finished deck! This customer wanted to add a deck to his multi-level outdoor space. 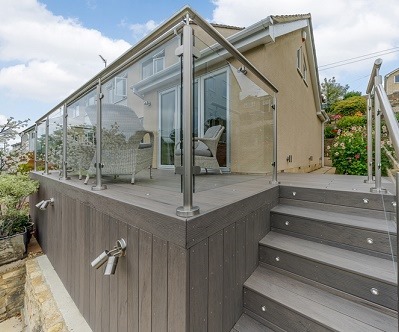 We supplied EasyClean Ashwood Legacy decking along with integrated deck lights and a stainless steel / glass balustrade. This customer wanted to replace her old softwood deck with a low-maintenance material that wouldn’t splinter or grow slippery in poor weather. "The site survey was thorough and the sales and design teams were very patient and helpful. So far, the decking is proving to be the low-maintenance product I desired, and I feel it has been worth the price." Take a look at our case study for photos of this project and more feedback from the customer. We provided Silver Maple composite decking to a customer in Llandrindod Wells, Mid Wales. 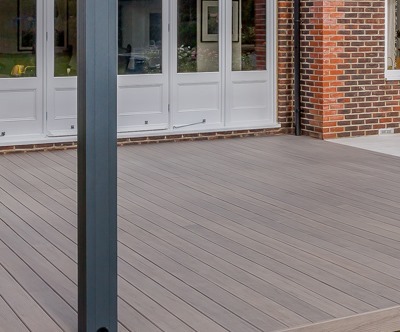 They wanted deck boards that wouldn’t be too difficult to manage, and our low-maintenance products were deemed the perfect solution for this lovely back garden. A customer in Berkshire noticed that her cheap composite decking was beginning to warp and split, and so she decided to replace it with TimberTech’s durable, long-life boards. 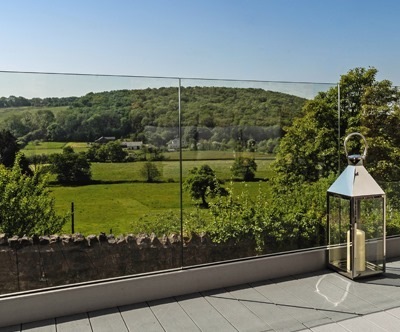 A couple from South Wales decided that our contemporary EasyClean Terrain Stone Ash decking would contrast perfectly with their home’s rustic stone walls, not to mention their view of the Welsh countryside! 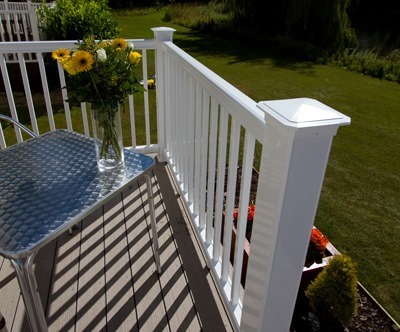 Mr and Mrs Cato asked us to provide a deck for their holiday home in rural Essex. In addition to providing VertiGrain 2 composite decking and a stylish RadianceRail system, we also took care of the installation work. 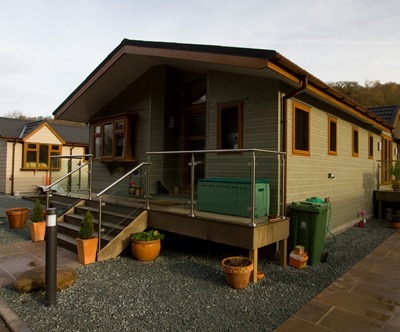 This deck was installed in Merebrook Park at the foot of the Peak District National Park. We replaced a rotting timber deck in Watermark (a resort in the Cotswolds) with our long-life composite decking. A picturesque white handrail made for the perfect finishing touch! 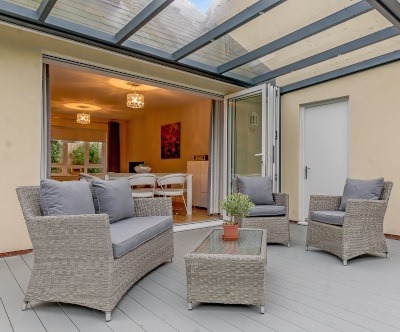 Mr Puckey of Pontprennau, Cardiff completely transformed his outdoor space with the help of our contemporary garden products. 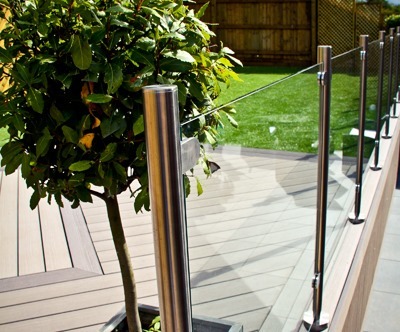 We supplied 15 square metres of decking, plus a beautiful glass balustrade. Garden designers Floral & Hardy asked us to provide swimming pool decking for this lovely home in Kent. Take a look at this case study to see why our boards are such a popular choice for pools and hot tubs! Our VertiGrain 2 decking was selected for this new property on the Milford Haven waterway. 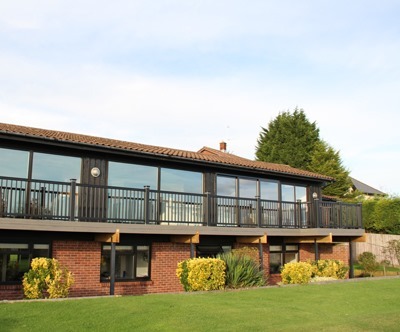 We provided the decking for two beautiful balconies on two different levels, both of which command spectacular views. After receiving a free sample from the TimberTech sales team, Mr Davies recruited us to replace and redesign his existing softwood deck. 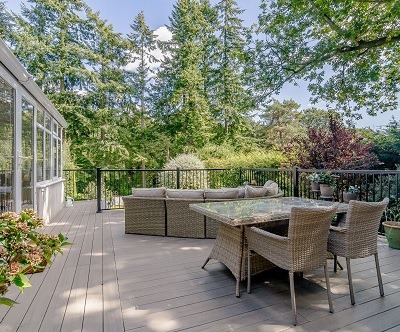 The new composite deck is a superb complement to this stunning garden! 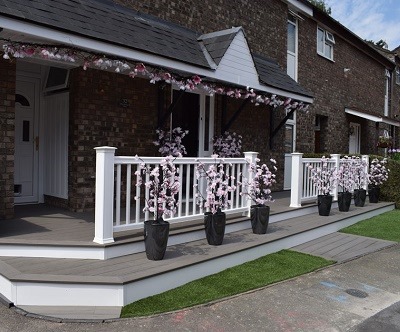 Ms Eisenberg used our Grey VertiGrain 2 decking (plus our modern-looking glass balustrade system) to revitalise her roof terrace in Hampstead Village, London. This raised deck was designed and installed by the TimberTech team. It all began with a visit from our in-house architect, followed by some creative design touches – the finished deck is a must-see!